I had hoped to have this card posted yesterday but time did not permit. 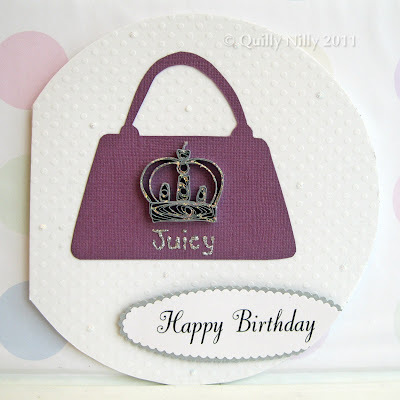 My coworker (yes the same one who orders everything) asked me to create a Juicy Couture birthday card for her daughter's 22nd birthday. I've heard of Juicy Couture, brand name for fashion, jewelry, hand bags; it's not my thing so I had to look up the logo/icon - the perfectionist that I am I wanted to make sure I got it correct. 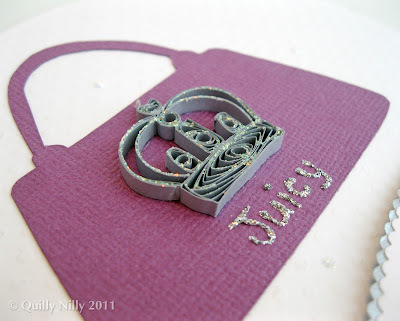 I used white swiss dot for the background, decided to go with a nice plum colored card stock for the purse shape and used silver quilling paper for the crown. I added just a light bit of clear glitter over the top of the crown just to give it some bling. My coworker loves it and is sure her daughter will as well. love the crown, the card turned out nice! That is sooo pretty.I love quilling...useless at it ,but love it.You are so clever. Wow, that crown turned out great! It is adorable. I have been making a prototype for a crown but it is not as regal as yours.....love it. Very Nice. I love the crown. I love me some juicy. Fabulous job.